UNITED NATIONS — President Barack Obama on Tuesday welcomed the new Iranian government’s pursuit of a “more moderate course,” saying it should offer the basis for a breakthrough on Iran’s nuclear impasse with the United Nations and the U.S. He signaled a willingness to directly engage Iran’s leaders, tasking Secretary of State John Kerry with pursuing that diplomacy with Tehran. “The roadblocks may prove to be too great, but I firmly believe the diplomatic path must be tested,” Obama said during an address to the U.N. General Assembly. Obama issued a stern message to the international body itself, saying its ability to meet the test of the times is being challenged by the dispute over what to do about Syria’s chemical weapons. He called on the U.N. Security Council to pass a resolution that would enforce consequences on Syrian President Bashar Assad if he fails to follow a U.S.-Russian deal to turn his chemical weapon stockpiles over to the international community. The president also addressed criticism of his shifting strategy for responding to an August chemical weapons attack in Syria. The U.S. seemed on the brink of a military strike before Obama abruptly decided to seek congressional approval, then joined the Russians in pursuing a diplomatic resolution. Obama announced that the United States would provide $339 million in additional humanitarian aid to refugees and countries affected by the Syrian civil war, bringing the total U.S. aid devoted to that crisis to nearly $1.4 billion. As the General Assembly meetings opened, the situation in Syria was overshadowed by a flurry of friendly gestures between the U.S. and Iran’s new government. Obama said recent statements by Iranian President Hasan Rouhani, a moderate cleric elected in June, should offer the basis for a meaningful agreement on Iran’s disputed nuclear program. The West has long suspected that Iran is seeking a nuclear weapon. Tehran has consistently denied the charge. 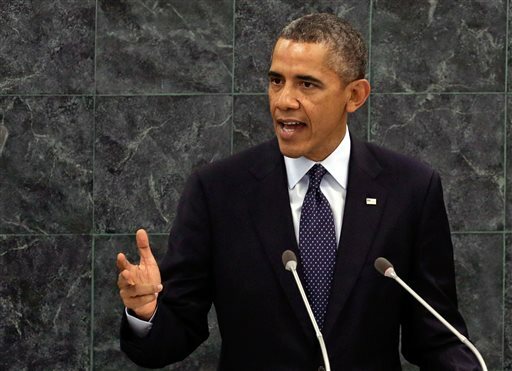 Obama said he was asking Kerry to pursue diplomatic progress with Iran, in coordination with five other world powers. Kerry will join representatives from those nations Thursday in a meeting with Iranian Foreign Minister Mohammad Javad Zarif. It’s unclear whether Kerry and Zarif will meet one-on-one on the sidelines of that meeting. And Obama also offered no hints of whether he will meet Tuesday with Rouhani. Even a brief handshake would be significant, marking the first such encounter between U.S. and Iranian leaders in 36 years. Zarif joined the Iranian delegation in the hall for Obama’s address. In Iran, the main domestic TV channels did not run speech live. Obama arrived at the annual U.N. meetings with diplomatic opportunities, not only on Iran and Syria but also on the elusive effort to seal lasting peace between the Israelis and Palestinians. While the prospects of a peace accord remain as slim as ever, the two sides have resumed direct talks, partly as a result of months of lobbying by Kerry. The president praised Israeli and Palestinian leaders for their willingness to take “significant political risks” in order to get back to the negotiating table. “Now the rest of us must also be willing to take risks,” he said, adding that the United States must recognize that Israel’s security depends on the formation of a Palestinian state. Obama will meet later Tuesday with Palestinian Authority President Mahmoud Abbas. He’ll also hold talks at the White House next week with Israeli Prime Minister Benjamin Netanyahu. Israel is watching closely as the U.S. and Iran edge close to direct negotiations. The previous Iranian president, Mahmoud Ahmadinejad, repeatedly threatened the destruction of Israel, and Israeli leaders have pushed Obama to be more forceful with the threat of military action in response to Tehran’s pursuit of a nuclear weapon. While Obama has said all options are on the table when it comes to dealing with Iran, he has preferred to use economic sanctions as a prod. The sanctions have had a substantial effect on Iran, leading to a spike in inflation and unemployment. American officials say the Iranian public’s frustration with a deteriorating economy led to Rouhani’s election and is driving his change in tone. But it is still unclear whether Iran is willing to take the steps the U.S. is seeking in order to ease the sanctions, including curbing uranium enrichment and shutting down the Fordo underground nuclear facility. Congressional officials from both parties have urged Obama to maintain tough sanctions until Iran makes significant nuclear concessions. Top Democratic and Republican senators sent Obama separate letters this week that also urged him to make clear to Tehran’s new leadership that the U.S. will not accept a nuclear-capable Iran. Obama also addressed the continued turmoil in the Arab world, where pro-democracy movements have had mixed results over the past two years. He defended the White House’s decision to maintain ties with the interim government in Egypt, which took over after the military ousted the country’s first democratically elected leader. The U.S. provides Egypt with about $1.5 billion a year, mostly military aid. The president’s top national security aides have recommended suspending much of the money.